A new white paper from PYA investigates recent and upcoming changes to the mortgage industry via the integration of mortgage disclosures, hence the creation of the Loan Estimate and the Closing Disclosures. The paper details the ins-and-outs of these disclosures, as well as provides key suggestions for creditors and title companies regarding how to accommodate these imminent changes. In a newly released white paper, “Clarification of Major Changes—Integrated Mortgage Disclosures,” PYA explores how the Consumer Financial Protection Bureau’s (CFPB) implementation of a highly anticipated Dodd-Frank provision is changing the ebb and flow of the mortgage industry and what this change means for financial institutions and title companies. 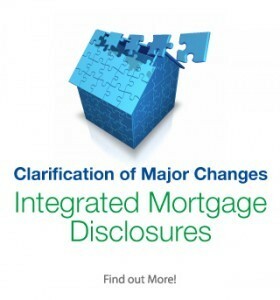 The white paper highlights major changes related to the integration of mortgage disclosures and provides definitions for the newly created Loan Estimate disclosure and Closing Disclosure, explaining how they work, when to use them, and what is included on each. The white paper provides a concise view of these required disclosures which become effective August 1, 2015, and offers an assessment of their impact on the mortgage industry landscape. PYA works with creditors and title/settlement companies to assure regulatory compliance with the CFPB ruling will be achieved. PYA has assisted a number of financial institutions with developing and implementing robust risk-based compliance programs.